Q: Recently, many people and media are speculating whether the US and the DPRK delegations would meet during the Pyeongchang Winter Olympics. The US side has talked about this many times. Do you have any information? What is your comment? A: Whether the US and the DPRK will have any contacts during the Pyeongchang Winter Olympics remains to be seen. The core of the Korean Peninsula issue is the contradiction between the DPRK and the US. As parties directly concerned, the DPRK and the US should enhance mutual understanding and accumulate mutual trust through dialogue so as to pave the way for the final settlement of the issue. At present, the situation on the Korean Peninsula appears to be easing up, which does not come by easily. Direct dialogues between the DPRK and the US will help consolidate the momentum and move forward the process of the political settlement of the Peninsula issue. We hope that the DPRK and the US could bear in mind regional peace and stability and seize the opportunity to make positive steps towards dialogues. Q: Who is China sending to the DPRK military parade tomorrow? A: We have said many times that the current mitigating situation on the Korean Peninsula does not come by easily. We hope that all parties could take actions to sustain that momentum and refrain from any move that may cause tension. Q: According to reports, after the Maldivian government declared a state of emergency, some oppisition figures have called for international pressure and even military intervention on the Maldivian government. What is your comment? A: As I have said before, what is happening inside the Maldives belongs to the internal affairs of the country and shall be properly resolved by all parties through dialogue and consultation. The international community shall play a constructive role on the basis of respecting the sovereignty of the Maldives, instead of further complicating the situation. 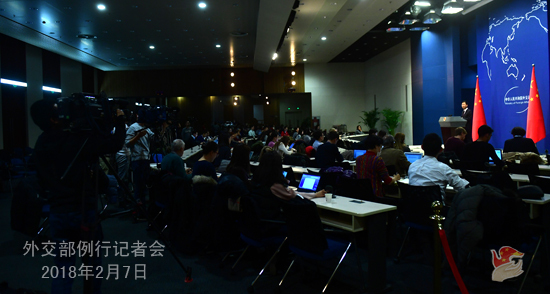 I want to stress that over the forty-year course of reform and opening-up, the all-around cooperation between China and foreign enterprises has not only boosted China's development, but also benefited the latter. As the 19th CPC Congress ushered in a new era for China's endeavors in various causes, a China in the new era will be more open and more confident. We will continue to pursue cooperation with foreign companies, and we are also ready to share China's development opportunities with them. However, it is needless to say that they must observe some basic rules. Q: You said that what happens in the Maldives should be settled internally. How can it be possible when the present president has arrested almost everybody of the opposition, including the Supreme Court judges and a former president, while another former president is now in exile? Are you suggesting that President Yameen should open up talks with opposition leaders and resolve the issue? A: I think I've made it very clear that we hope various parties of the Maldives will properly resolve differences through dialogue and negotiation and restore national and social stability as soon as possible. We are calling on all relevant parties to do so. In the meanwhile, we believe that the Maldives government, political parties and people have the wisdom and capability to cope with the current situation on their own. Q: The former Speaker of Maldives Parliament, who is also from the opposition party, has said that it is under the influence of China that Yameen, the President of the Maldives, has been able to stand up to the pressure and nobody should underestimate the influence of China over Yameen. He also said we saw that in that manner Yameen recently signed the FTA with China, and he thinks that it is the support of China that has allowed him to be bold. Do you have any comment on that? A: China and the Maldives maintain friendly and cooperative relations. The signing of the FTA is in the interests of the two countries and peoples. The fact has proven that since the signing of the FTA, the cooperation between the two sides has deepened, which benefits the two peoples a lot. Just as I said, what is happening now in the Maldives falls within the internal affairs of that country. China has always adhered to the principle of non-interference in other's internal affairs. Q: According to reports, the former Maldivian President Nasheed called on India for a military intervention to resolve the crisis by sending a special envoy to the Maldives. Do you have any comment on that? A: As I said just now, the international community should play a constructive role on the basis of respecting the sovereignty of the Maldives rather than take actions that may further complicate the situation. Q: According to reports, the Singaporean Defense Minister said that China and the ASEAN countries would not be able to reach an agreement on the South China Sea Code of Conduct within the year. Does China agree that this time frame would not be possible? A: What I have seen is the remarks by Singapore's Foreign Minister Vivian Balakrishnan yesterday, which seem different from what you said. 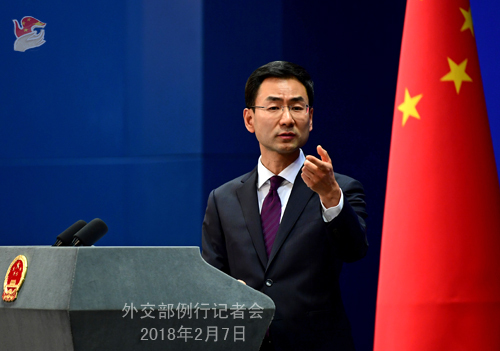 Foreign Minister Vivian Balakrishnan's remarks testify to the commitment of China and the ASEAN countries to advancing the Code of Conduct in the South China Sea (COC). Last November, the leaders of China and the ASEAN countries reached important consensus on launching the consultation on the text of the COC. Upon agreement, China and the ASEAN countries will hold the 23rd joint working group meeting on the implementation of the Declaration on the Conduct of Parties in the South China Sea (DOC) in Nha Trang, Vietnam, from March 1 to 2. This is the first institutional meeting where various sides will exchange in-depth views on the COC and other topics. 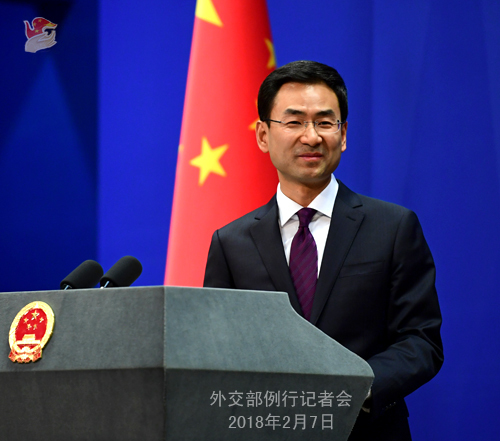 China will, guided by the consensus of the leaders, vigorously consult with the ASEAN countries on the text of the COC in an effort to jointly build an architecture of rules that suits the actual conditions of this region and meets the needs of regional countries. Q: The Chinese mainland has offered to send help after the earthquake in Taiwan. Has Taiwan responded to this offer? A: The earthquake that hit the Taiwan region is not a diplomatic question. Spokesperson of the Taiwan Affairs Office of the State Council has issued a statement on the earthquake that shook Hualian, Taiwan. You could check that on the website.